As we creep up on the last couple months of summer, there is still plenty of time for Michigan motorcycle riders to find an exciting event to attend! From BBQ’s to charity rides, summertime brings out the best for Michigan motorcycle owners. Also, riding in Michigan is limited throughout the year so making the best of the summer is a must! From state parks to up and down the coast line of Lake Michigan, there is always somewhere to ride in Michigan. 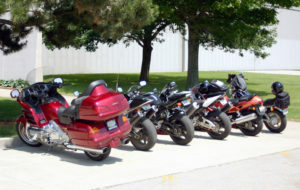 Our staff is made up of motorcycle enthusiasts who know the excitement summertime brings to motorcycle owners in Michigan. We would love to share that excitement with you! Be sure to share your photos and add @sellusyourbike on social media during your visit to this summer’s upcoming Michigan motorcycle rides & events. We may use your photo on our site, or even in an upcoming newsletter or blog! Michigan offers plenty of motorcycle events in to keep you busy this summer. There is also plenty of time to upgrade your motorcycle before riding season is over! There are many people looking to sell a used motorcycle in Michigan to avoid having to store or ship a motorcycle during the non-riding season. Because selling a motorcycle online is quick and easy, you will have time to find your dream bike and still take advantage of the end of summer deals! Finally, for more information on selling a motorcycle for quick cash, or to get a free quote on your used Harley, Yamaha, or Suzuki motorcycle, contact us today!